IE Business School - International MBA | Quick News Bites!!! IE start-up “Shared Secrets” is getting close to launching its Private Beta version. If you haven’t done so yet, you can still book your spot! The iPhone version of “holoholo” is out! Download the app and Live the City! 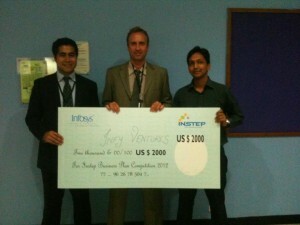 22 teams, students from MIT, Princeton, Duke, INSEAD, LBS, ESADE and many more… but IE wins Infosys Instep Business Plan competition!!! Alice Neves, Tripku Co-Founder, just helped to announce the winners of the next round of Start Up Chile on Twitcam!!!! For those interested in adventure sports such as hiking, climbing, skiing or any other, IE students are trying to create an IE Adventure Club: “Diverse experiences sparking unique ideas” -quoting Tom Malloy.